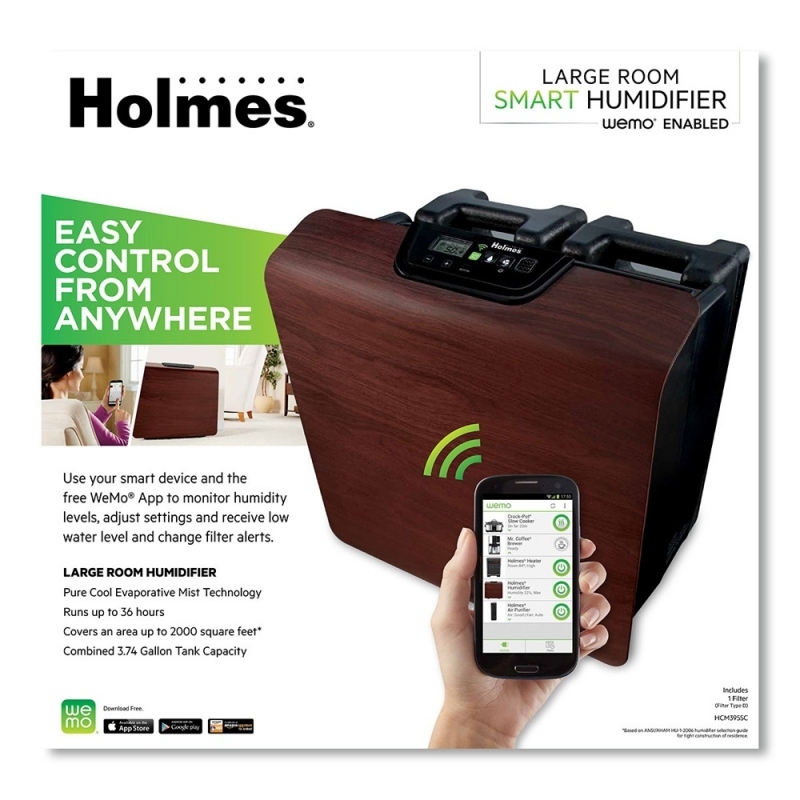 Holmes HCM3955C WeMo Whole House Console Humidifier. Large Filling Capacity - 3.74 Gallon. Large Daily Humidity Output - 10 Gal. Maximum humidifying area 2000 sq. ft.
Digital Programmable Humidistat with LED Display. Employs Single Large High performance circular wick filter. "Arm&Hammer" infused wick filter helps eliminate odors. "Microban" anti-microbial protection inhibits growth of odor causing bacteria and mold. Filling Capacity - 3.74 Gallon (two water tanks 1.87 Gal. each). Daily humidity output - 10 Gallons. 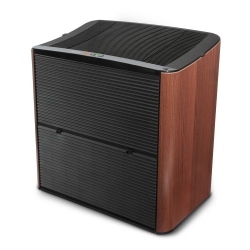 Three speed fan control allows for variable humidity output. Choice of Automatic or Manual (Stay On) operating modes. 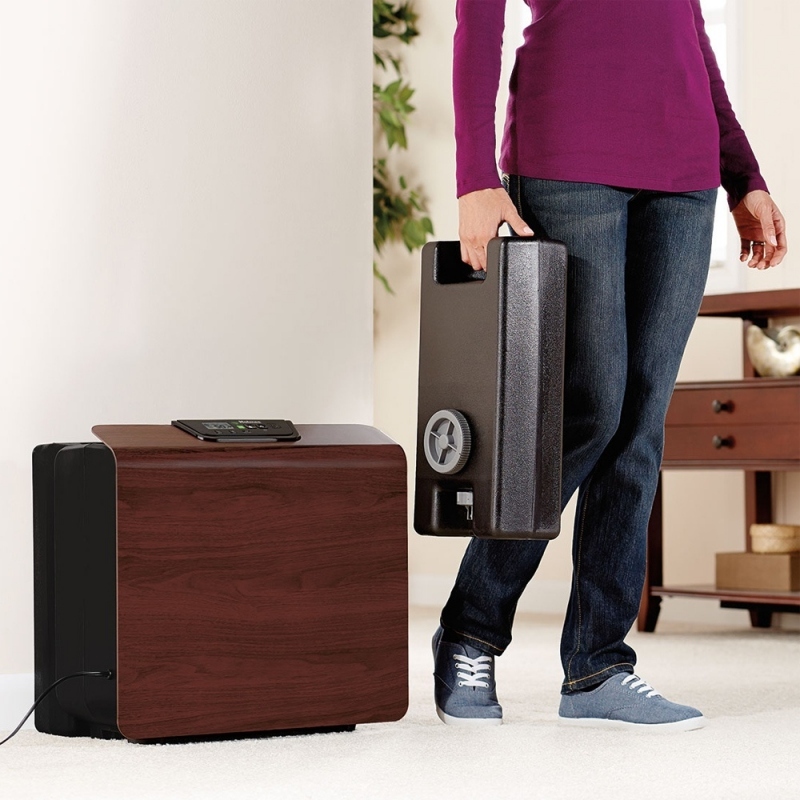 Exclusive Air Flow technology ensures an Extra Quiet operation. Level of Noise per Speed: Low - 35 dB, Medium - 50 dB, High - 60 dB. Maximum humidifying area (average constructions) - 2000 sq. ft.
Power consumption (approx. 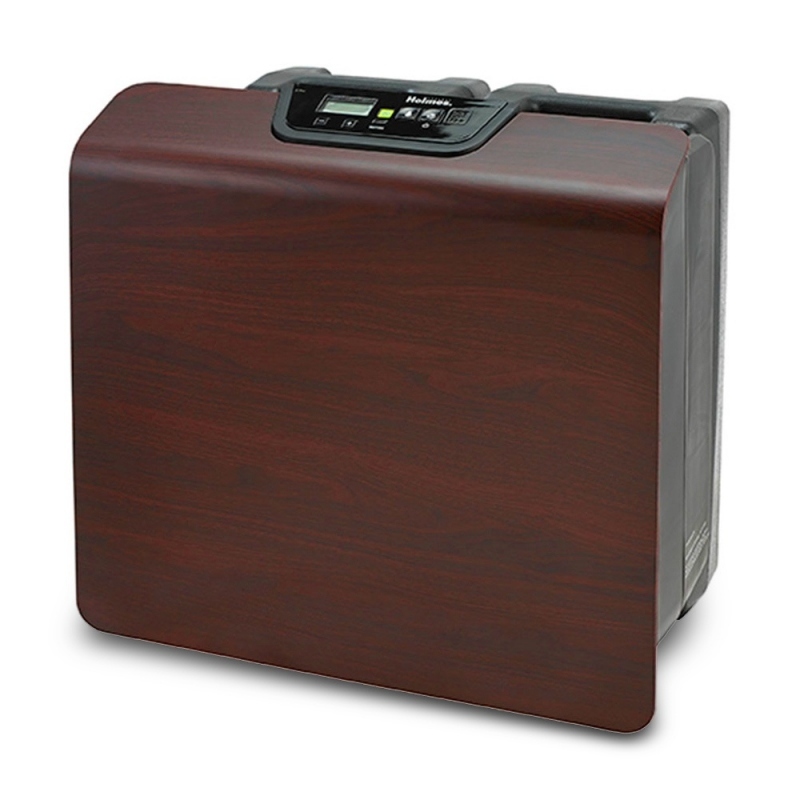 ): Low - 50 / Medium - 70 / High - 90 Watts. 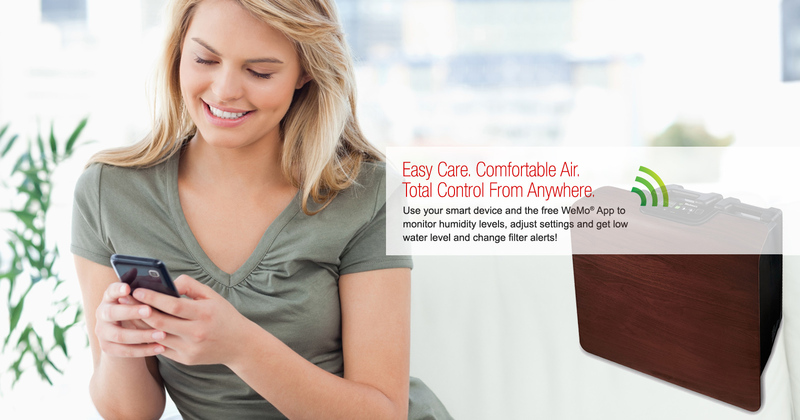 Digital Programmable humidistat maintains precise humidity level automatically. Built-in digital hygrometer displays current and set room humidity levels on LED display. Operating humidity range 40% - 60% with 5% increment. 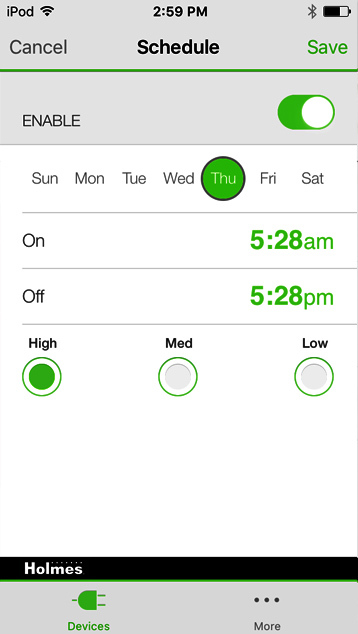 24-Hour Programmable Off Timer (with 4h / 8h / 16h / 20h / 24 Hour settings). 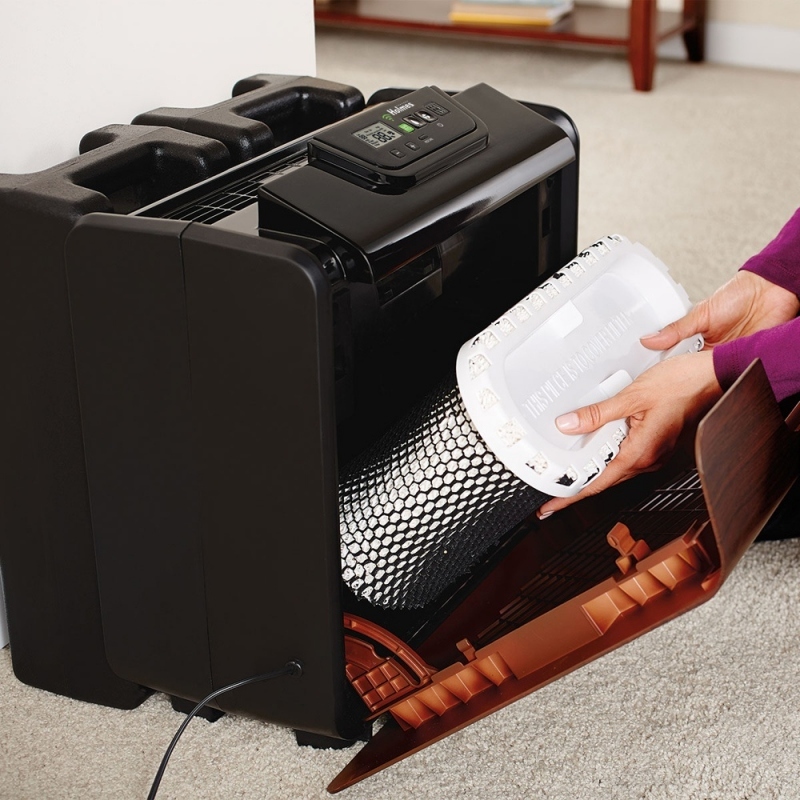 Easy access to filter compartment and easy filter replacing procedure. 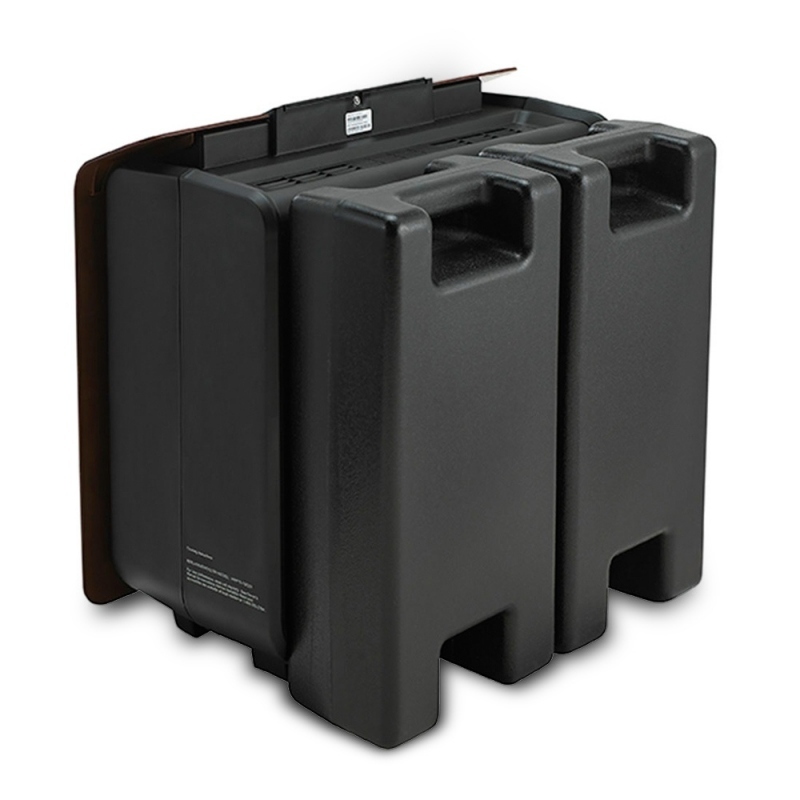 Two removable water tanks with comfort carry handle. Side fill option ensures easy, spill safe refill in most sinks. WeMo Smart Feature. Manage Your Home Environment from Anywhere. 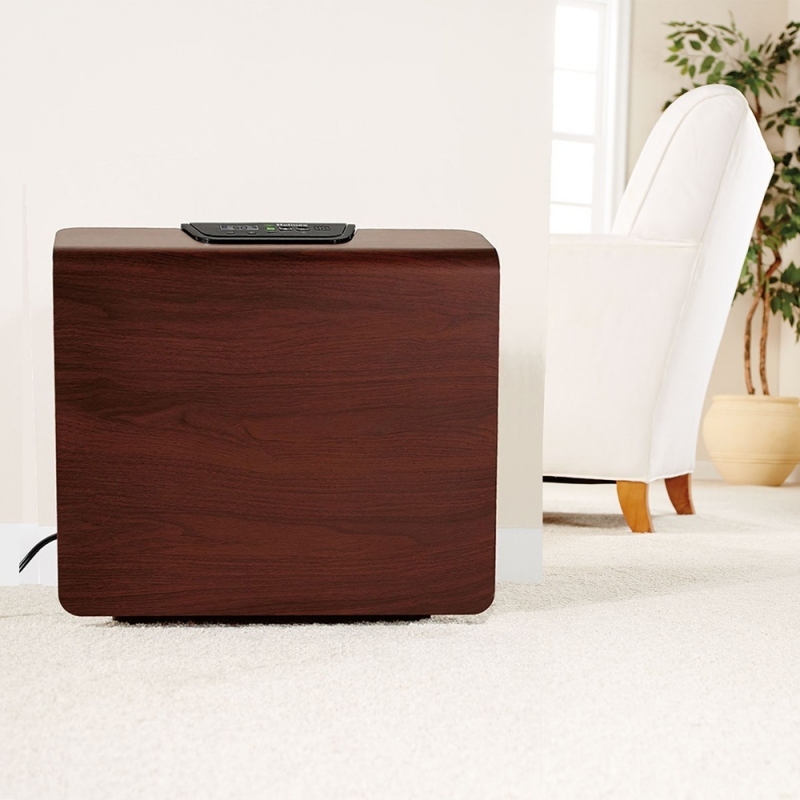 Holmes WeMo technology allows you to stay connected with your humidifier from anywhere. Receive an alert when the water level is getting low. Get a reminder when the filter needs replacement. Adjust the humidity setting of your humidifier. 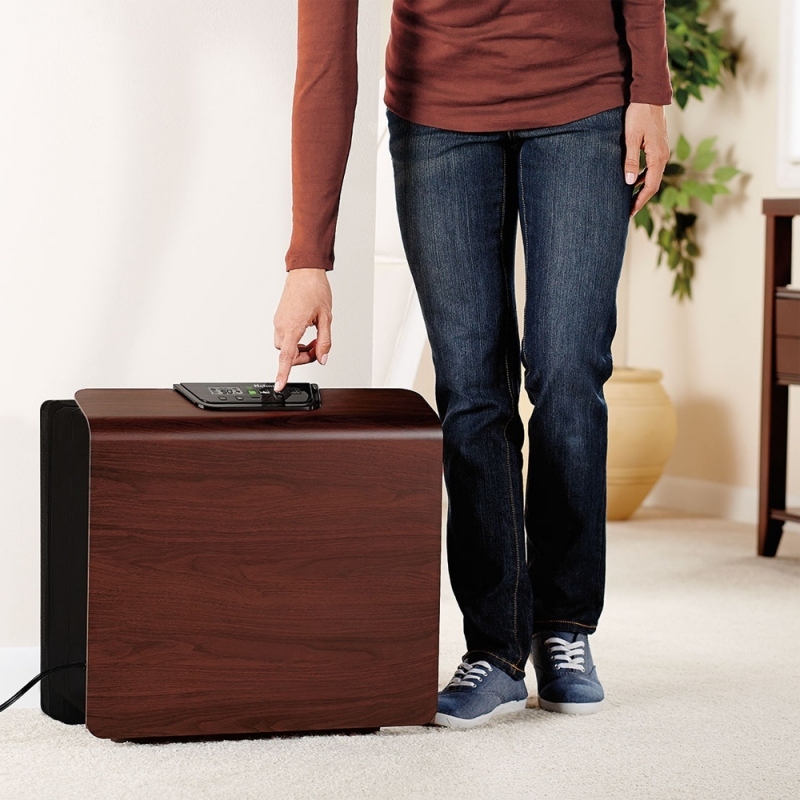 Set a humidifier operation schedule to fit your lifestyle. 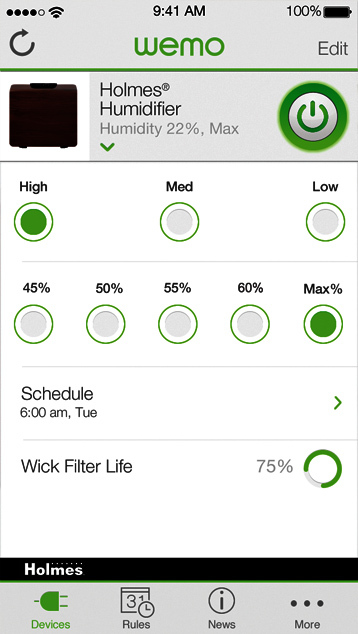 Connect your humidifier to Weather apps to make it adjust operation according to weather changes. 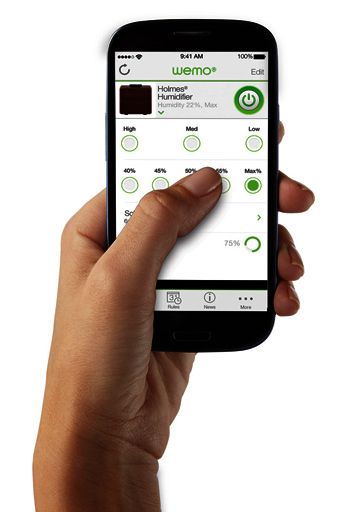 Free WeMo App on your Smartphone or other Smart device allows you to check the current humidity level and adjust it according to your preferences for optimal comfort. With Holmes WeMo Smart Humidifier you can program and adjust settings as needed to keep your home at an optimal comfort level according to the changes in weather conditions. 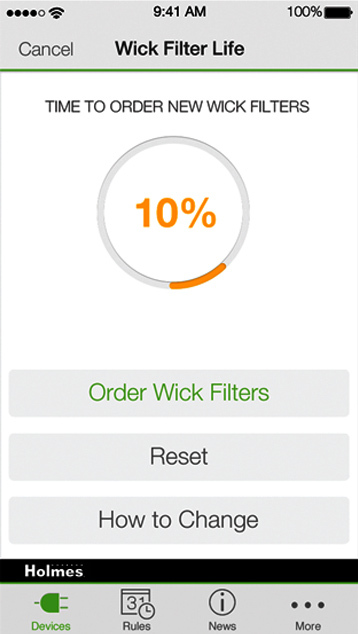 With WeMo Get a Filter Change reminder alert when it is time to order new filter right on your smart phone or smart device. Daily Humidity Output, Gal. 10 Gal. Maximum Humidifying area, sq. ft. 2000 sq. ft.